Welcome to the Night of Community Art Page! A Night of Community Art is a student, staff, and faculty event which will include a small art gallery focused on the Principles of Community and will allow attendees to be able to participate in two additional projects. At these stations, attendees can partake in creating a community art piece that will be displayed in the Dean of Students Office as well as allow them to learn more about how others use the Principles of Community in their positions. We are also in talks with the Multicultural Center to make my event a community paint night for the mural being painted in the Multicultural Center. Food will be provided at this event as well. I know the prospect of food is a big draw for students, so I do want to highlight if you RSVP you will get a meal not just hor devours. 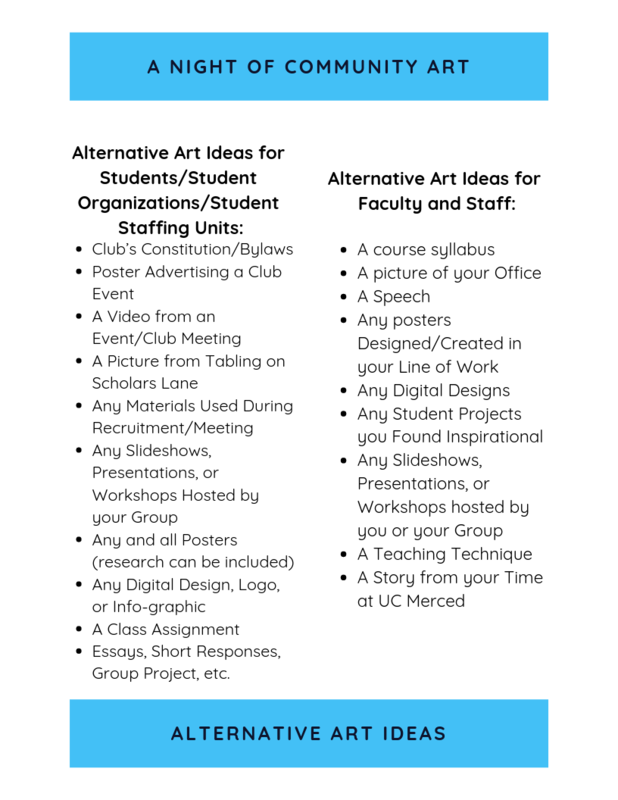 For more information or any questions, please contact Valerie Moss at vmoss@ucmerced.edu. Also, follow @ucm.art.night on Instagram for constant updates on A Night of Community Art!